Why Can't the LibDems do Something Right? Can’t someone just turn us around. food bank charity made to pay £546 inspection fee by Stockport Council. Si possis recte, si non, quocumque modo rem. “Regardless of the information we proactively provide to the public and provide to you in response to your FOI requests, you continue to question the Council’s motives and actions and maintain that we are not being open, honest and transparent. You continue to make requests for information you state will uncover ‘financial irregularities’......"
In light ot fhe recent court case (see link below) in which the Council received a lower fine due to its budget deficit - which apparently didn't exist - please give me full details of how this misunderstanding arose including the written instructions given to the Council's barrister on this issue - and what steps Stockport Council took to correct this misunderstanding with the court subsequently. You may claim legal privilege, but there is now no outstanding court case and I shall take this matter to the Information Commission should you fail to comply with this request. There will be more to follow in respect of the email you sent me. I saw your email below and the various others that have been flying back and forth, including Coun. Weldon's. In a couple of weeks' time I am planning to do a story on this, and just wanted you to know that it's on my radar. I have been well aware that there was something strange about this, as I sat in court and heard what both the defence and the judge said - there is no question that that judge thought, and was allowed to think, that the council was in defecit and therefore gave a more lenient fine. And I have the notes to prove it. However, in order to make the story as strong as possible I am waiting on a couple of comments that won't be available for a couple of weeks. So do keep me posted if you have any more correspondence on this, and I will be in touch. Councillor Weldon seems jolly cross with me (again) for believing what I read in the Express, which I find a far more reliable source of information than the Council. Be that as it may, Councillor Weldon has informed me regarding the court case of the Reddish pensioner who might have died because the Council failed to carry out proper maintenance at 62 Council buildings, the Council's barrister misunderstood his brief when he said the Council was in budget deficit. It would seem to me the honest thing for the Council to have done would have been to subsequently contact the court and correct that apparent error. The Council got a large fine but the judge said it would have been larger had the Council not been in deficit, which, of course we now learn, it wasn't. So, is there any written evidence that the Council contacted the court to correct this misunderstanding? I assume no-one in court from the Council corrected it at the time, or the judge wouldn't have made those comments. subjected to abuse as dished out below. Dig as much as you like, it is all in your imagination. So, I am yet again subject to a rant from Councillor Weldon for believing what a judge says in a very serious court case, in which the Council was subjected to a large fine and which revolved around the death of a pensioner and in which it would appear the Council's barrister seriously misled the court. It remains to be seen whether the Council took steps to correct this misunderstanding. This was all reported in our award-winning local paper. "The barrister misunderstood his brief, no deficit existed." How interesting, I assume someone from Stockport Council took the time at that hearing or subsequently to point out this misunderstanding. I might contact the court; I might not. Pleas see forwarded email below This is my final email to you. Any reply will be automatically routed to the FoI officer. From now on the council will deal with your emails etc on a weekly basis as outlined in the email previously sent to you . I will for a final time explain as plainly as I can the error in your email. It was a proper response from the FoI officer and so to say it was not is an untruth. Whenever there is a clash between reality and your assumptions then your assumptions are the victors. There is not and there has never been a budget deficit. The barrister misunderstood his brief, no deficit existed. As has been explained repeatedly, if we maintain spending and services in the next financial year as this current financial year, the council will need to reduce its spending from April 2010 by 5.6 million. I do appreciate local government finance can be complex, but I do hope this final confrontation with reality can finally alter your opinion and your propagation of untruths. ""I understand that there is no such deficit; therefore no notification was needed. " To carry on misrepresenting the position would be to foster an untruth. The news story refers to the discovery of asbestos in a number of schools and the subsequent risk assessments that were then required as soon as possible. The staff working on risk assessments were diverted as described in the article. 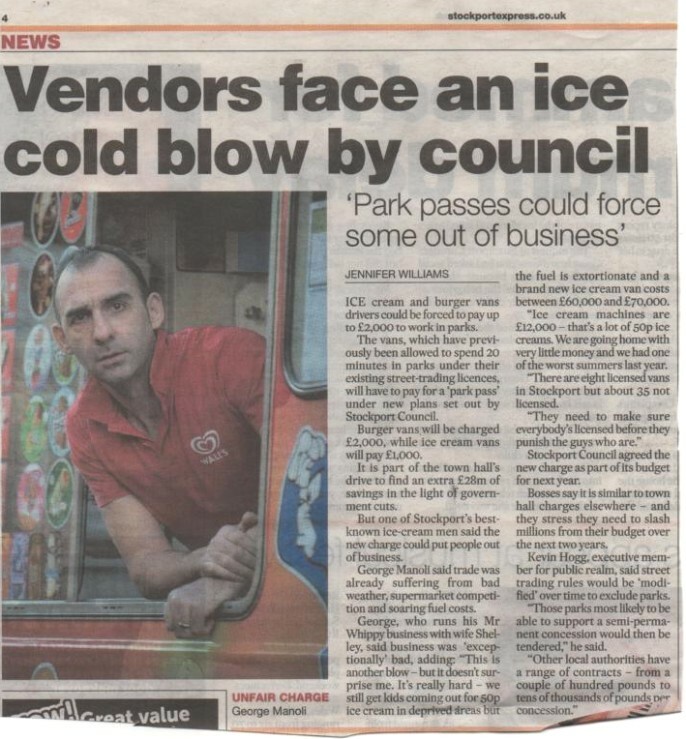 This is an issue for many local authorities not just Stockport. Mr Webb is a leading member of his profession and we as a council are happy to allow him to work with DCSF and other professional bodies to help maintain the CYPD directorate's leading position within the country. A commitment of less than one day a month is a small price to pay to maintain Stockport's leading position. Indeed he was personally asked by two Cabinet ministers to take on the work as Stockport CYP directorate and the council itself is recognised as a leading local authority. To try to characterise the directorate as failing is to foster a further untruth. Moreover modern communication technologies enable Mr Webb to be always in touch regardless of his physical presence. 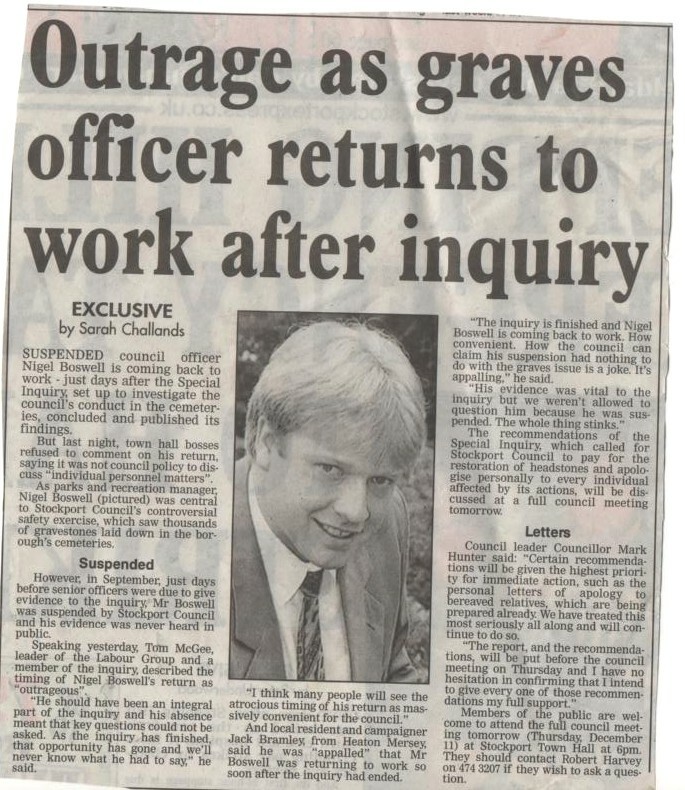 This is the news story about which I asked the FoI question. fine from the judge (please see newspaper article). I have received some documents regarding Alison Davies from another source. It would appear that the Council should have been more helpful to Ms Davies. well amount to hundreds of thousands of pounds. council's 62 others were scaled down as a result"
currently in deficit and so it should receive a fairly lenient fine." Digging deeper, Councillor Weldon, digging deeper. you do not like or agree with is different to not receiving a response. are repeated when perfectly adequate responses are given. on the same date about the same subject (attached for reference). this request has not received a response will be placed on file unanswered. I am writing in response to your request for information below (ref 1920). the financial position of the Council." pay him a lot of money to do) to his primary employment. Councillor McGee said in an article in the local press that the Council had known about the asbestos in schools issue for quite a long time before action was taken. The court issued a lower fine because of the budget deficit. Nevertheless, it was quite a substantial fine and we must remember here that someone died in this incident and other people were put at risk in 62 other locations from the same lack of maintenance. I seem to recall the Council stated around that time it was holding back £5 million to cover eventualities. There would appear to be Council failings also involving a death of a young person on the front page of the Times this week. The performance indicators show CYPD is failing to meet a high proportion of targets. Mr Webb may be in touch wherever he is but he is not concentrating on the very serious problems in Stockport if he is in high profile meetings in London. "The residents of Beech Av are to be congratulated on getting a well deserved residents only parking scheme after battling for so long. As your correspondent says there are consequences for a lot of other people. The Council have won too. They collect not only about £1000 from the residents permits but, according to residents, the car park in Beech Av will take an extra £17500 a year. That’s how to make money out of peoples’ misery. Cllr Weldon is very pleased about Beech Av. He should be. He and all his Executive Colleagues can now apply for free parking permits for anywhere in Stockport on Council business, of course. However those in Ripley Av and Gladstone St are not winners. The Council has already written that they must now pay to continue their parking scheme or disband. Even though they decisively voted twice against the scheme. Why does the Council treat their double petition with contempt? LibDem Cllrs promised they would not allow the Council to railroad any street into anything they don’t want. Why do LibDems not stand by their written commitment? Ripley Av and Gladstone are victims because they don’t slavishly agree with an unnecessary tax. Then 100 more RPS streets, mostly around Edgeley Park Stadium will not win. They will soon be told that they too will have to pay or disband. So 50 houses in Beech Av win and 5000 houses stand to lose what they are happy with. Strange interpretation of democracy. Finally what about the people who cause the problem. I doubt most go to the medical centre or the hospital to purposely annoy but because they have to visit for health issues. The LibDem technique of demonising sections of society to support a political objective has a long and dangerous history that I despise. Can I be the only person in Stockport who refuses to appease with a LibDem policy that is so partisan. It is neither liberal nor socially democratic. It narrowly exploits one set of views against the needs of others and makes money out of that misfortune in the process. No one in Stockport needs nor deserves that approach. There are better more modern solutions proven by other Councils with a more generous and encompassing approach." I refer to your request dated 2nd June 2007 which was received by the Council on the 3rd June 2007 and your subsequent request for an internal review dated 23rd August 2007 of the Council’s handling of your request. "It is my interest to get details of correspondence between EEDs staff and Cllr Goddard regarding the publication of the 2nd Stage Report New Resident Parking Scheme." In response to this request you received e-mail correspondence between Mr Newell and Councilor Goddard the draft report attached to one of the e-mails sent by Mr Newell to Councilor Goddard. It would seem that Mr Newell conducted a search of his e-mail account and provided you with the information that he found in that search. Although on reflection under section 16 of the FOIA, Mr Newell should have made you aware that the background papers in relation to the RPS were and still are publicly available. I believe Mr Newell acted in good faith and provided you with his correspondence with Councilor Goddard in response to your request. I have asked the officers with involvement in the RPS to conduct a search of their e-mail accounts in order to establish whether there is any further correspondence between officers and Councilor Goddard in relation to the publication of the 2 nd Stage Report regarding the RPS and there is no further correspondence. You have now seen the full file in relation to RPS which contained all the drafts in existence and I am aware you have received copies of numerous documents from this file. To avoid duplicating work if you could specify which documents you would like copies of I will arrange for them to be supplied. In conclusion I believe that your request could have been handled more efficiently and the Council failed to fully comply with section 16 of the FOIA which relates to advice and assistance. However, I do not believe there was any wilful obstruction, just a case that Mr Newell was not fully aware that he was under a duty to inform you of your ability to access the full file as it is a public file. I noted from the Stockport Express that: "neither Councillor Weldon nor any other Stockport Council Executive member will benefit personally from the Beech Avenue parking scheme". I have seen a document which stated: " A free permit will be issued to all Cllrs allowing them to park in RPZ (Residents Parking Zones) in their wards, to allow for the carrying out of their responsibilities, Executive members permits will allow them to park in any RPZ in the Borough". Maybe the LibDem Councillors intended to proceed with this not inconsiderable perk for themselves, but under the beady, watchful eye of Mr. XXXX - a meticulous checker of facts in my experience - they decided they really wouldn't be able to get away with it. Thanks, Mr. XXXX, for your supberb efforts in holding our councillors to account. Previously, SMBC made a £6.00 admin charge to make photocopies of documents which should have been placed on the Council's website - in this case the bypass environmental impact assessment. I threw a hissy fit about the massive charges to read and copy complex documents and they backed down. The Public Realm service (parks, road and pavement repairs, refuse collection) comes under Stuart Bodsworth’s portfolio. Transport policy and strategy including the A6 to Manchester Airport Relief Road, public transport, cycling, car parking and residents parking come under Iain Roberts’ portfolio."